Additional members have been recruited onto the committee to ensure the committee’s continuity in understanding the operational needs of the Association and for the purpose of succession planning. The Chapter’s total membership stands at 34 with only 9 members who have applied for SAQA designation and who are in good standing. The majority of members have a challenge in meeting the terms of annual membership renewal with the main challenge being payment of membership fees. Membership is made up primarily by EAP Practitioners from the Public Sector as well as a few from the Private Sector, and some who are service providers. Substance Abuse management in the workplace. As part of Limpopo Chapter’s Care of the Caregiver initiative, members get the opportunity to experience the services they themselves offer in the form of free health screenings, team building and game drive activities. These activities allow our members to network and consult with their peers, share best practices and remain effective and efficient in offering professional services to their clients. Our next Chapter seminar is on 9 June 2017 and will be focusing on Bereavement Programmes in the workplace. We hereby invite our members to join us in examining this topical issue in order to gain more insight and skills from a presenter with an international experience. What makes Limpopo Chapter unique? 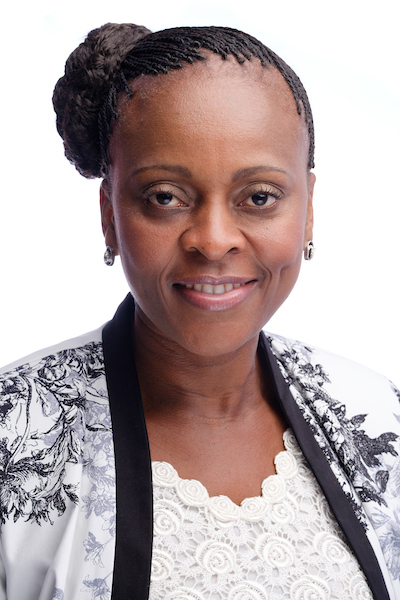 The current President – Chabalala Tinyiko Godfrey – is the product of this Chapter. He served in various portfolios such as treasurer before he joined the National Office in 2007. 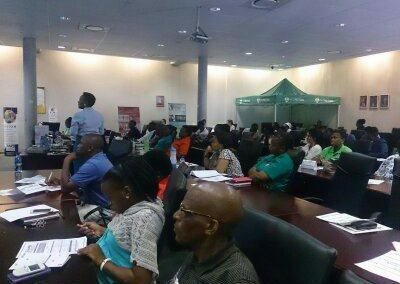 The Limpopo Chapter operates in a predominantly rural province characterised by a high rate of illiteracy, great distances between workplaces and compliance to cultural diversity. 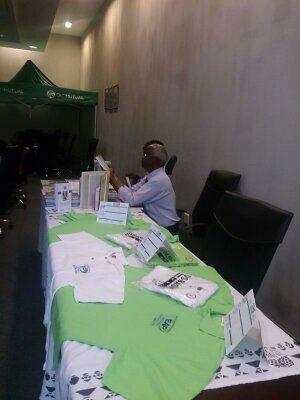 Our members travel long distances to attend Chapter activities in the capital city, Polokwane. Despite the vastness of the Province, we have members who are committed to attend Chapter activities. As an intervention, the committee has a goal to establish at least two Sub-Chapters at District level in order to increase accessibility of our services to our members in distant locations. EAP professionals are typically centrally based at head offices with only a few at district level where they are easily accessible to branch-based employees. As a result EAP professionals are required to travel long distances to service a referred employee. The majority of employees are semi-literate and illiterate. They prefer, and are more comfortable with, a face-to-face interview. EAP professionals are required to tailor their services to accommodate various cultural protocols within the Province. This poses a challenge in meeting EAP standards, for example, in terms of the delivery of crisis intervention during bereavement where a family mourning period must be observed before outsiders can offer assistance to the person grieving. 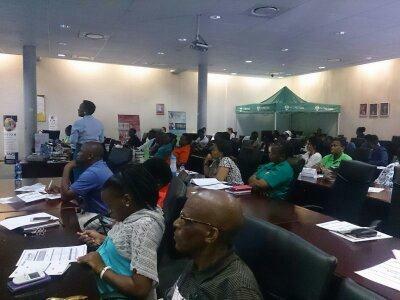 In the light of the above mentioned hurdles EAP professionals in Limpopo Province find themselves being asked to give assistance outside of the professional scope of EAP services. Clients regularly expect assistance in issues that involve family dynamics such as conflict regarding estates distribution, divorce in cases of polygamy marriage and custody of children when there is death in the family. EAP Practitioners play an important role of a caring face to the employee’s family on behalf of the employer especially during the time of employee’s death. The past chairpersons for their strategic leadership and direction. The past committee members for their knowledge and time, and support to the chairpersons. The sponsors for their partnership and investment in terms of resources and information. The EAPA –SA Board for their capacity building, leadership and support. 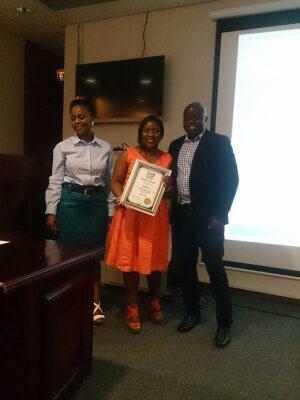 The members of EAPA-SA Limpopo Chapter who made it possible for the Chapter to exist. Lastly, the current committee and President for steering the Chapter’s growth and development. 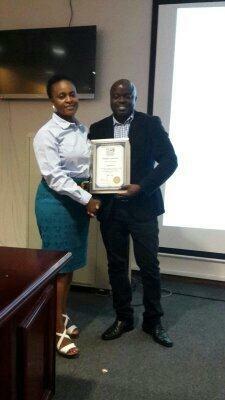 Membership and SAQA professional designation. 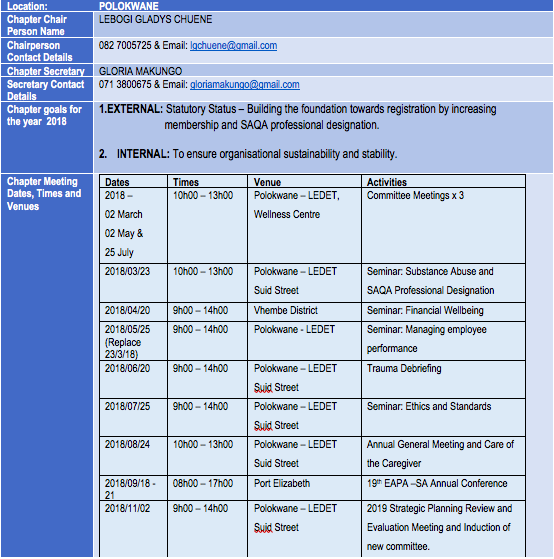 To ensure organisational sustainability and stability. Identify Chapter CSI project and sponsorship for it.